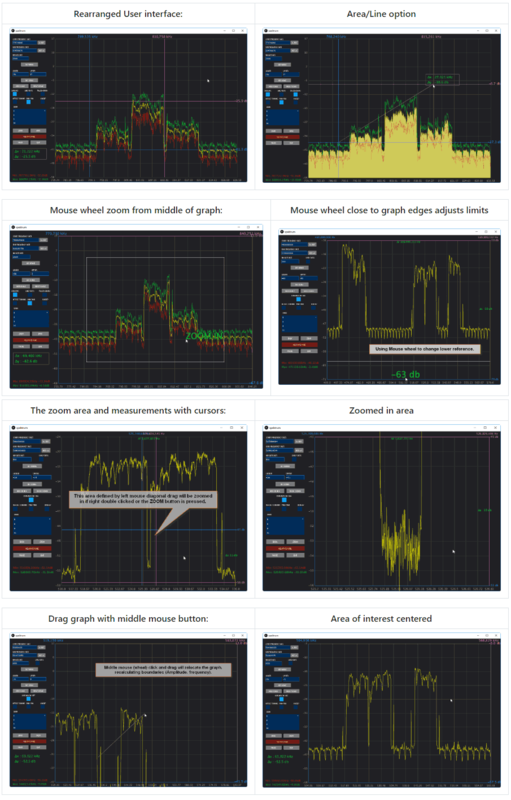 Spektrum is a popular spectrum analyzer program that is used with RTL-SDR dongles. It is based on the command line rtl_power software and is compatible with both Windows and Linux. Thanks to it's easy to use GUI it is an excellent piece of software for scanning and determining where active signals exist, or for measuring filters and antenna SWR with a noise source. Recently SV8ARJ (George) and SV1SGK (Nick) have been working on extending the original open source Spektrum code. Their improvements focus around the UI and making it more functional and easier to use. Currently the updated branch is in alpha, and they are hoping that any testers could help report bugs, issues and wishes to them. The code is available on their GitHub and the latest Windows test build can be downloaded from their DropBox. 2 Cursors for Frequency axis. 2 Cursors for Amplitude axis. Absolute and differential measurements with cursors. Zoom functionality of the cursors's defined area (gain + frequency). Mouse Wheel Gain adjustment on graph (Top area for upper, low area for lower). Mouse Wheel Frequency adjustment on graph (left area for lower frequency, right for upper). Mouse Wheel in the centrer of the graph performs symetric zoom in/out. View/settings store/recall (elementary "back" operation, nice for quick zoomed in graph inspection). Right click positions primary cursors. Right Double Click positions primary cursors and moves secondary out of the way. Left Double Click zooms area defined by cursors (Amplitude + frequency). Left Mouse Click and Drag on a cursor moves the cursor. Middle (mouse wheel) Double Click resets full scale for Amplitude and Frequency. Middle (mouse wheel) Click and Drag, moves the graph recalculating limits accordingly. Reset buttons to Min/Max range next to Start and Stop frequency text boxes. Cursor on/off checkbox now operate on all 4 cursors. Filled-in graph option (line or area). Display of frequency, Amplitude and differences for all cursors. Fixed: Save/Reload settings on exit/start. IMPORTANT : delete the "data" folder from the installation location if you have it. Filling in graph option (line or area). Thank you so much for your efforts. Fits ALL my requirements. Am running on Windows 7 am all is good. Thanks for the feedback. Just updated with graph saving as reference and a db->VSWR calculator. @Dave H : The offset is high on the todo list. Also more graph operations like persistence, averaging etc. I only hope free time (a rare thing) does not run out. Thank you George! I’m looking forward to trying it. Great work guys, especially solving the “Can’t open RTL-SDR Service” problem commented on your GitHub. That’s been driving me mad for months. I notice the settings are saved to a csv file – be nice if you could add a way to save different settings to allow commmonly used ranges to be accessed quickly ? The sv0.18 version now has presets. If you want give it a try and comment. Windows test build works just fine after the initial “Can’t open RTL-SDR Service” issue, but the fix explained on GitHub works perfectly. Well done gentlemen! Having tested on Windows 10, I have also tested on Windows 8.1 on a reletively slow laptop and it performs perfectly. Give the option to open the RTL-SDR dongle directly instead of the error I noted on my previous comment. Great work and such a handy tool. Just wondering how the Gain figures correlate with dBm, etc? This looks promising. One of the reasons I’ve gotten into SDRs is to use one as a spectrum analyzer. Does the software have a way to enter a frequency offset? That would make it easier to use with an RTL-SDR and a converter like a Ham It Up. Excellent. The best i have seen so far.